Originally published under the title "When Muslims Kill Muslims, They Can Still Act in the Name of Islam." A July 1 jihadist attack on the Holey Artisan Bakery in Dhaka, Bangladesh, left 20 hostages and 2 policemen dead. In light of the recent terrorist attacks in Muslim nations, the argument is again being made that, say what they will, the terrorists are obviously not acting in the name of Islam—a religion which bans the indiscriminate slaughter of fellow Muslims. Yet is it that simple? Since the Medieval era, Islamic clerics have justified the killing of other Muslims—intentionally, for they're not "real" Muslims (e.g., Shias), or unintentionally, as collateral damage (who become "martyrs" and receive Islam's highest paradisiacal rewards)—in the name of jihad. Even so, it's clear that, whenever they can, the jihadis do make an effort to preserve the lives of Muslims. This was the case in the recent terror attack in Muslim-majority Bangladesh. On July 1, 2016, six Islamic militants shouting Islam's ancient war cry opened fire on a bakery in Dhaka, the nation's capital. The assailants entered the Bakery with crude bombs, machetes, pistols, and took several dozen hostages. They burst [into] the restaurant firing their weapons and I could hear them shouting Allahu Akbar. They took me and two of my colleagues and forced us to sit on chairs, with our heads down on the table. They asked me whether I was a Muslim. As I said yes, they said they wouldn't harm or kill any Muslims. They will only kill the non-Muslims. All the time I prayed to Allah, keeping my head down. Several times I vomited.... They said they had no intention of hurting us as we were Muslims. Similarly, Rezaul Karim, the father of Hasnat Karim, one of the hostages who spent 10 hours with the gunmen and lived to tell about it, relayed his son's experience: "The gunmen were doing a background check on religion by asking everyone to recite from the Quran. Those who could recite a verse or two were spared. The others were tortured." Whenever they can, jihadis make an effort to preserve the lives of Muslims. 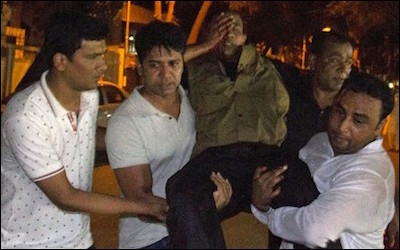 In fact, the Muslim hostages were treated well and exhorted to uphold their Islam: "They (gunmen) did not behave rough with the Bangladesh nationals [i.e., Muslims]," Reazul said, based on his eyewitness son's testimony: "Rather they provided [Ramadan] night meals for all Bangladeshis." Late in the night, they asked us whether we were fasting as it's Ramadan. We said yes and they brought some food for us so we could eat before daybreak.... When they realised that troops might storm the building, they came to our room one last time and told us not to tarnish the name of Islam, be a good Muslim and uphold the pride of Islam. Not only are these experiences telling, but separating Muslims from non-Muslims during a jihadi attack is hardly limited to this one incident. Around 2:30 a.m. on January 3, 2015, masked men burst into a housing complex in Sirte, Libya. They went room to room checking ID cards, separated Muslims from Christians, handcuffed the latter and rode off with 13 of them. 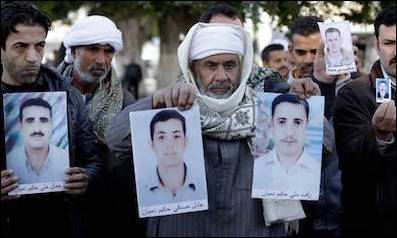 Coptic Christians whose relatives were abducted in Libya protest in front of Egypt's foreign ministry in Cairo, January 19, 2015. According to Hanna Aziz, a Christian who was concealed in his room when the others were seized, "While checking IDs, Muslims were left aside while Christians were grabbed.... I heard my friends screaming but they were quickly shushed at gunpoint. After that, we heard nothing." These 13 Christians would later appear on video, along with another eight Christians abducted elsewhere, being beheaded on the shores of Libya by ISIS for refusing to renounce Christ and embrace Muhammad. In October 2012 in Nigeria, Boko Haram Islamic jihadis stormed the Federal Polytechnic College, "separated the Christian students from the Muslim students, addressed each victim by name, questioned them, and then proceeded to shoot them or slit their throat" massacring about 30 Christians. On November 20, 2015, Islamic jihadis seized 170 hostages and killed 20 others in a mass shooting at the Radisson Blu hotel in Bamako, the capital city of Mali. Once again, "Some people were freed by the attackers after showing they could recite verses from the Koran." On April 2, 2015 in Kenya, gunmen from the Somali Islamic group, Al Shabaab—"the youth"—stormed Garissa University, singled out Christian students, and murdered them, some beheaded. A total of 147 people were massacred, almost all of whom were Christian. Joel Ayora, who survived the attack, said gunmen burst into a Christian service, seized worshippers, and then "proceeded to the hostels, shooting anybody they came across except their fellows, the Muslims." Collins Wetangula said gunmen were opening doors and inquiring if the people inside were Muslims or Christians: "If you were a Christian you were shot on the spot. With each blast of the gun I thought I was going to die." In 2014, approximately 50 militants from Al Shabaab went on a killing spree in Mpeketoni, a predominantly Christian town on Kenya's coast. They chanted "Allahu Akbar," killed whoever could not recite verses from the Koran, and went door-to-door asking residents their religion, killing those who answered "Christian. "More than 57 people were killed, including six children of church pastors. "During a lull in the firing," of the 2013 attack on a Nairobi mall, that left 67 dead, "the gunmen spoke in Swahili for Muslims to identify themselves and leave." According to a survivor, "an Indian man came forward and they said, 'What is the name of Muhammad's mother?' When he couldn't answer they just shot him." During an early morning raid on quarry workers sleeping in their worksite tents near the city of Mandera, along the Somali border, Christians and Muslims were separated before the Christians, thirty-six of them, were beheaded or shot dead. Al Shabaab attacked a bus and massacred 28 of its Christian passengers, while identifying and leaving unharmed Muslims. After abducting a group of traders near the island of Lamu, Al Shabaab militants released three of them, because they were Muslims, but beheaded the fourth, a Christian. The phenomenon of Islamic jihadis making an effort to identify and separate Muslims intermingled with non-Muslims before beginning the slaughter is widespread (above examples come from Arab, East Asian, and sub-Saharan African nations) and a clear reminder of who is the true and intended target of jihadi terror—"infidels"—even if surrounding Muslims must sometimes make the ultimate sacrifice and become unwilling martyrs of the jihad.